I like that you don't gave to fight with getting the lid on. 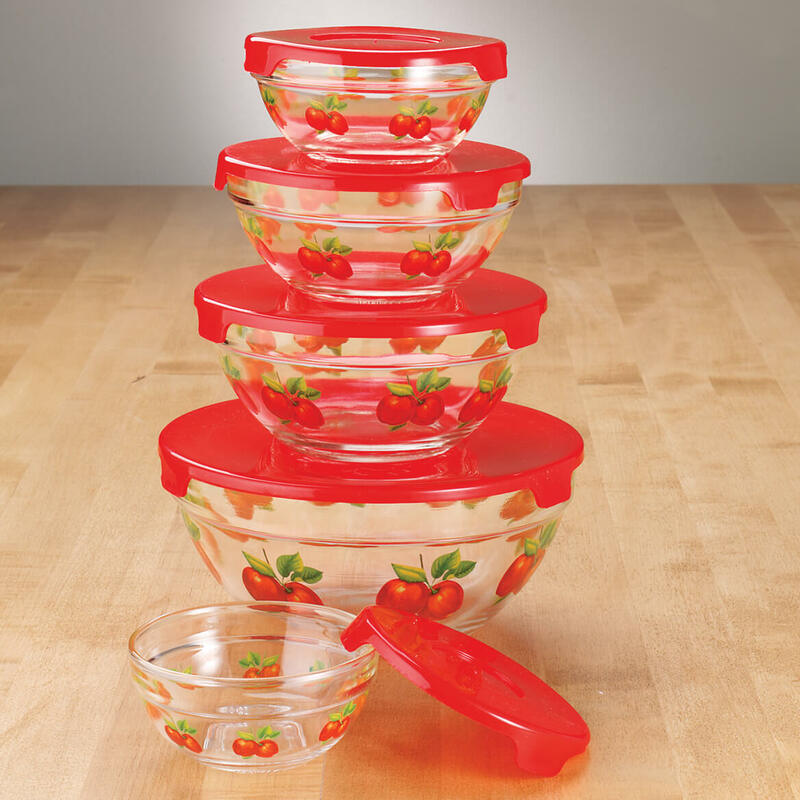 Not only are these bowls pleasing to the eye, but they're great for going from the cabinet to the fridge to the microwave to the dishwasher! So pretty yet so versatile! I think I need a second set! Bought these as a part of a birthday surprise for my best friend. She decorates her kitchen in red and apples. I love these bowls. They are the same color of my new apt. Since receiving these, have used them daily. They are perfect smaller size, so easy to use, and attractive for serving. These are great for small amounts that you don't have to use a big container for. I thought these would be larger so I was disappointed. They are good just for very small things. The bowls are nice looking, but the first time I washed them by hand one of them chipped. They are very fragile that I would be afraid to put them in the dishwasher. Also, they are quite a bit smaller than they appear. The lids don't fit as tight as I had hoped for. The bowls are attractive but they are small, they are good for small leftovers. Bowls looked much bigger in the picture. The largest bowl is not much bigger than a cereal bowl. Don't know what uses I'll have for the (even) smaller ones. product cracks and chips too easily but what do I expect for the price I paid? The picture for this item is very deciving. When you get it you are like is this really what I am getting? It is VERY, VERY small. I LOVE the color red in my kitchen, and these will be great for counter-top storage of some items. I needed glass bowls for the microwave. Glass is safer for cooking or reheating than plastic. I prefer glass storage over plastic. will be great for pre-measuring ingredients when cooking with grand children. Just really pretty nesting storage bowls. Lids aren't absolutely water tight, so don't tip them too far, but they are great for fridge to microwave! Plastic lids no problem in dishwasher. 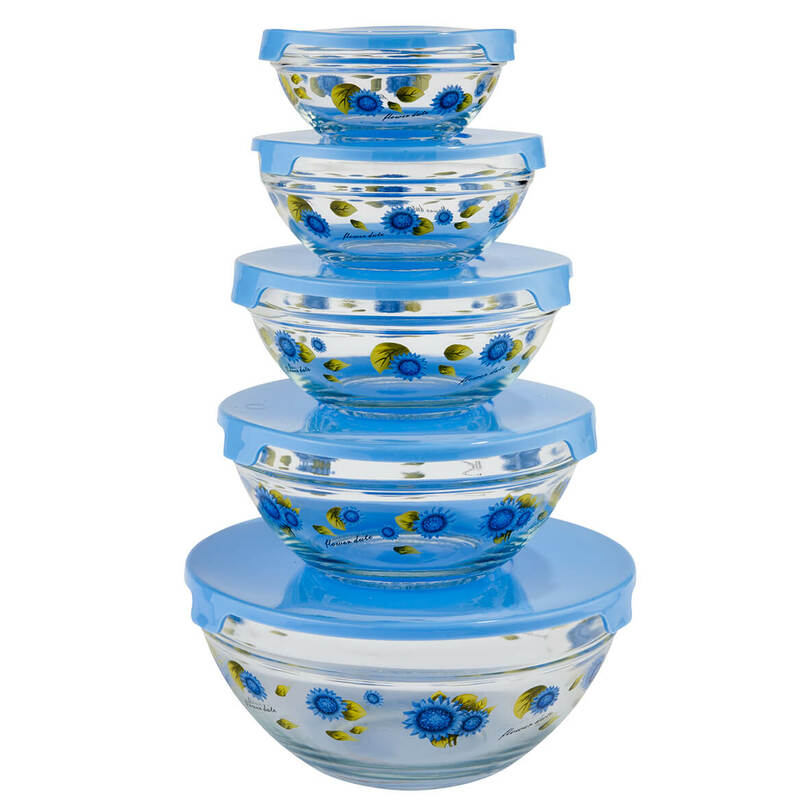 Same for blue and yellow flower bowls of the same type. They are glass and they will break, which is why I ordered another set! Fits the theme of my kitchen. Have ordered these bowls before but with a different decoration. I have need the bowls with tops. They match the dÃ©cor in my kitchen so I couldn't pass them up. New bowls because my mobile home burn down to the ground. 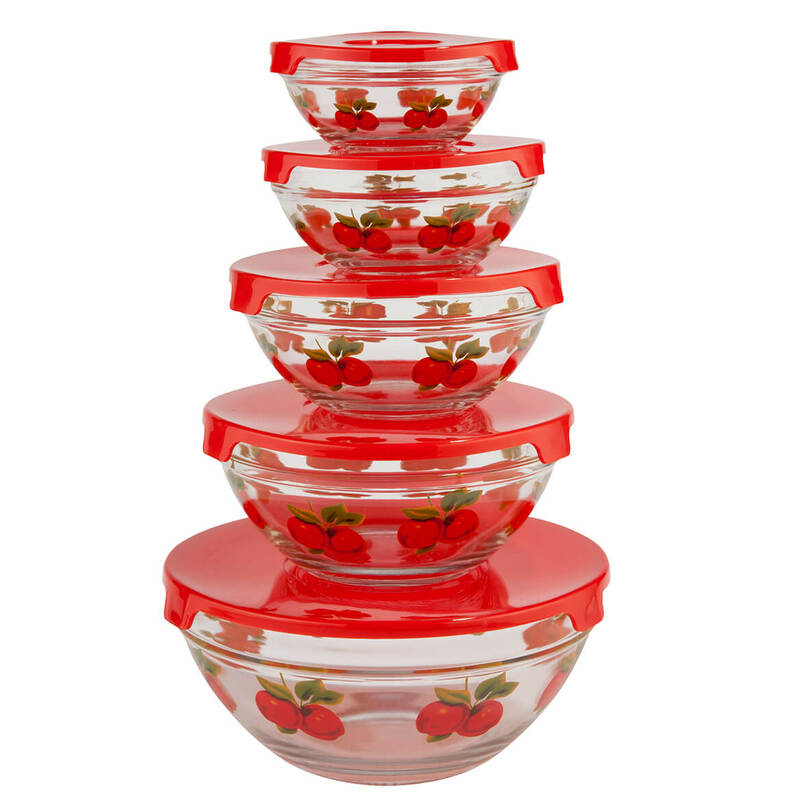 My Kitchen is a beautiful apple orchid kitchen and I've been trying to find these glass apple bowls everywhere and I finally found them at a very reasonable price so I had to purchase them like right at the moment. I love glass bowls because they are sturdy and so appealing. I like the design and the color; goes perfect with everything else in my kitchen. Wanted to give my son a set. Our oldest has apples in her kitchen and this would make a nice touch to her décor. The color and because they are glasss. I never seem to have enough glass bowls with lids. I need glass bowls. They are hard to find priced reasonably. T bowls are utilitarian and my wife liked the color. plastic or rubber does not do well for food. Because they are glass and the lid looks like it is easy to remove. I like these bowls. I ordered them the first time several months ago liked them so much I wanted another set. They go from frig to micro to table and they are attractive. For the price they are a gem. need information on size of each individual bowl? BEST ANSWER: Thank you for your question. We have included below the measurements of each bowl. We hope this information will be of help to you. BEST ANSWER: The bowl is microwave safe, but not the lid. BEST ANSWER: Thank you for your question. The bowls are made in China. We hope this information will be of help to you.